The prototype Height Rider 22 straight telescopic self-propelled boom lift unveiled from Nifty. 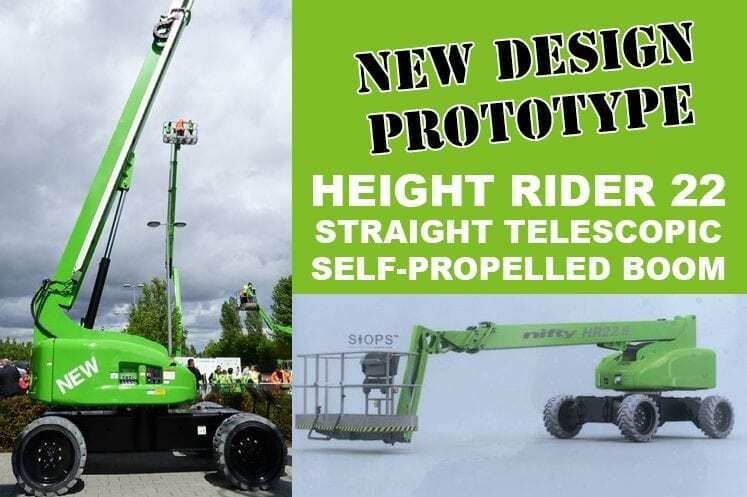 The Height Rider 22, Nifty’s first straight telescopic self-propelled boom lift prototype has been shown off at their recent suppliers’ day and Vertikal Days trade show in UK. Nifty’s engineers showcased a prototype of the new machine at their factory open day and were interested to hear feedback and comments from customers before the new machine goes into production. The new 65ft HR22 S 4×4 Hybrid has a three-section straight boom and a jib with 150 degrees of articulation and minimal tail swing. The unit will weigh 10 tonnes or less when fully equipped and yet offers 18.8 metres of working outreach and 280kg platform capacity. The Height Rider 22 will feature the company’s well-proven hybrid power pack and a heavy-duty battery pack. It will be four-wheel drive, with oscillating axle and work at grades of up to 40 per cent. Dimensions are compact with an overall stowed length of 8.97 metres, overall width of 2.49 metres and an overall height of 2.7 metres. The new HR22 will feature SiOPS built-in secondary guarding and non-marking rough terrain tyres as standard. Controls will be digital and it will have on-board diagnostics – as with all new Niftylifts. The machine will also be telematics ready. John King hosted several Australian customers at the open day, treating them to a preview of the new products that will be available in the future. The day included a gala dinner and factory tours. All Niftys are designed and built at the new factory in the UK and to see the origin of the machines certainly made the experience worthwhile.